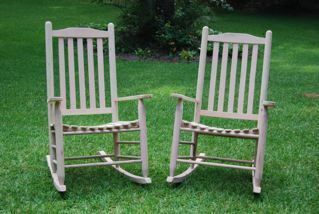 Beautiful SET of Oak Rocking Chairs! 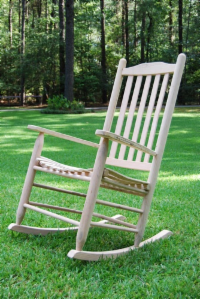 Each rocker is a full 43" tall and is handcrafted from solid oak by our family friends here in the USA. The design features a perfect pitch (the angle of the seat to the ground when empty and at rest), and a double scooped contoured seat. Construction uses NO GLUE or harsh chemicals. Instead, the tried and true Swelled Joint technique keeps everything in place, and the joints actually get tighter with time. The notched dowels make them nearly impossible to remove. 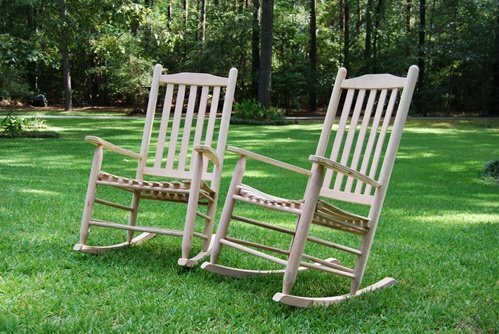 Experience these fabulous rockers for yourself- no shortcuts are taken in the craftsmanship of these chairs. Simple assembly required. You only put the rockers on, then start rocking.